In the absence of relevant details, observers have no choice but to read between the lines. 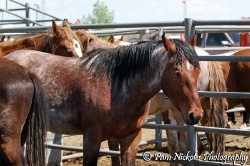 On Friday, April 16th, we learned that the BLM had started to castrate all male horses aged four and under. It’s hard to believe that the gelding has progressed without incident, but the BLM has been mum. What little we know about how the colts and young stallions are being castrated comes from the report of Dr. Eric Davis, who has inspected the Fallon facility on two different occasions, on behalf of the Humane Society of the U.S.
“Succinylcholine is the most rapidly acting immobilizing agent available. Succinylcholine and other similar agents have been used extensively in wild animal immobilization in the past, but newer, non-paralyzing agents have supplanted them. . . So in addition to the residual physical pain of the castration procedure, the young Calico mustang males are experiencing profound emotional stress from their inability to control what is happening to them. While juggling too many things at once, time slipped by and I never even opened the proposals until two days ago. With only just days left, here is what I found…. The U.S. Forest Service (USFS) simultaneously issued two press releases and two proposals, both related but neither mentions the other. The first is a proposal to ram through the establishment of Appropriate Management Levels for 11 Wild Horse and Burro Territories (WHTs) that will be used forever more to round up any wild horses or burros that exceed these levels. The second is a notice that they will be preparing an Environmental Impact Statement to evaluate and re-authorize livestock grazing for much of these same areas. Both are presenting skeletal information and ancient data at best and I have worked unsuccessfully for hours trying fill in the mountains of gaps these proposals are omitting from the public. Before getting into the few specific details about the area I was able to glean during my research, it is imperative to explain how they are manipulating the public process here. We have laws that mandate how the agencies must conduct themselves; laws that mandate quality data, accountability for agency actions, specific guidelines about what and how they must review proposals and how they must involve of the public in order to ensure our Nation doesn’t evolve into a dictatorship of secrecy and tyranny. the Wild Free-Roaming Horses and Burros Act of 1971. ABC SHOWED OLD HORSES AS EXPAMPLES ON THE RANGE, WHICH IS A LIE, NO MENTION OF CATTLE GRAZING, MINING AND DRILLING…. MOSTLY TALKED ABOUT THE REASONS FOR ROUND UPS THAT THE BLM GAVE THEM. 286 MILLION ACRES WERE TAKEN AWAY FROM OUR WILD HORSES AND NO MENTION OF THAT….. WHEN WILL THE PRESS SEE THE TRUTH BEHIND THESE ROUND UPS, WHEN THEY ARE ALL GONE ? Two internal-use BLM reports were obtained earlier this year through the Freedom of Information Act; Alternative Management Options Plans from October 2008 and the Team Conference Calls Report from July – September 2008. In these documents, BLM members presented, analyzed and discussed several management plans aimed at reducing the population of the wild horses on the range as well as those in holding facilities. The BLM’s response to these recommendations was that it is considering these plans as part of a 5 year strategy plan. While Tom Gorey may continue to claim that it’s pure propaganda that the BLM is in the process of eliminating the wild horses, the notes regarding the slaughter of our wild horses in foreign countries, combined with the advisory board recommendation to sell the horses to foreign countries proves otherwise. A Horse That Limps Isn’t Lame? The Bureau of Land Management is an agency which has nomenclature all its own. The jargon is a juxtaposition of what the outside world calls things – what things actually are it is a language directly opposite the words everyday Americans speak and understand. In BLM speak a wild horse isn’t wildlife. In BLM speak a clearly injured horse that limps isn’t lame. In BLM speak a helicopter provoked stampede is nothing more than a gentle run down a 5,000 foot slope over a rocky ten mile trek. Never mind the rocks, never mind the hooves. Never mind four spindly fetlocks carrying a 1,000 pound load. 261 million acres BLM manages, and more than 34 million acres dedicated to the Mustang. to move it to the U.S. Department of Education, if for no other reason than for its employees to learn the English they forgot from school. BLM will have to reinvent itself. And well it should. made no compelling argument to counter the charge. genetically viable.And the list goes on, and on, and on, and on, and the public deserves a fair hearing in which all sides are presented. We believe BLM has much to answer for, much will be disturbing. Louisiana’s Landrieu has said she would consider moving the BLM’s stewardship for wild horses to another agency. Perhaps that proposal deserves serious consideration. It’s clear that not enough people working for the Bureau of LandManagement understand enough English to clearly read their mandate under the law. I-Team: Nevada BLM’s Wild Horses Money, Where Is It? More than 30,000 wild horses are now being held in government pens. That is more horses than exist out on the open range. Critics say the reason for the logjam is that the Bureau of Land Management, which is supposed to manage wild horses and burros, spends most of its budget on roundups but very little on adoptions. Are the charges true? Put it this way — suspicions confirmed. No matter where you stand on wild horses, your tax dollars are being spent in this program. The I-Team filed an information request with the BLM back in February to find out what they spend on the wild horse program. It took until August to get the answer. And then the spin campaign began courtesy of the BLM-Nevada’s top wild horse official, whose statements to us were simply incredulous. It seemed odd that BLM’s Suzie Stokke would be so bubbly. Less than 24 hours earlier, 129 wild horses in the BLM’s Palomino Valley facility had died horrible deaths. And days before that, more than 70 wild horses were found dead of nitrate poisoning on the Tonopah Test Range. These horses were Stokke’s responsibility. Yet she was giddy. The reason Stokke was so stoked, despite the deaths of more than 200 horses, is the success of a horse adoption event. One hundred wild horses were adopted out during a gala show. And $50,000 from the Nevada BLM budget sponsored the event, even though it was held in Fort Worth, Texas. As far as we know, it was the biggest one time adoption expenditure the Nevada BLM has ever made. This, it turns out, is simply not true, just like much of what we were told by Susie Stokke. Wild horse advocates aren’t surprised that Stokke would okay an adoption event somewhere other than Nevada, where most of the horses live. Her critics say Stokke has long opposed spending the Nevada budget on adoptions, even private efforts. For example, Jerry Reynoldson worked out a deal with California BLM officials to bring Nevada wild horses back here for adoption events not controlled by the Nevada office. He hoped to sidestep Stokke. Her office stopped him in his tracks. There are now more horses in government pens than there are on the open ranges, about half of them from Nevada. More than 9,000 a year are rounded up here, but fewer than 250 are adopted out. It’s a formula for disaster, Reynoldson says. Just feeding them costs millions. Federal law requires the BLM to work on adopting out the horses. A $500,000 BLM study recommends getting the private sector involved. But under Stokke, the Nevada BLM puts nearly all of its resources into roundups. From 2003 through 2006, BLM Nevada spent around $2 million a year on roundups, just under half of its entire budget. During the same time, it spent a mere $122,000 a year on adoptions. Is it any wonder the pens are filled up? Contrary to what Washington, D.C. BLM told us, Stokke says she spends $200,000 a year on adoptions. But the numbers didn’t add up. During the I-Team’s seven month wait for budget information, Stokke inflated the 2007 adoption spending to more than $500,000 by adding in $400,000 in grants that will be paid to two organizations over the next five years. She said a Las Vegas horse group was paid $50,000, but it only received $10,000. The decision to let other states handle adoptions wasn’t made nationally, but rather by the Nevada managers. It means there’s a pittance for adoptions but plenty of money for roundups, and thus, the pens will always be full. The I-Team’s WEB EXTRA interview with Ms. Stokke speaks volumes about the attitudes of those who call the shots in the Nevada Wild Horse & Burro program. Read The I-Team’s Part 2: How the range studies used to justify the roundups.